I recently bought a new laptop because my old one was having problems. From my purchase experience, I want to pass along the following helpful piece of advice: NEVER EVER BUY A NEW COMPUTER. Limp along with your Apple Lisa for as long as you possibly can – because once you buy a new computer, your nightmares have just begun. The following is a 100% true retelling of my experience. I chose to shop at one of the major Big Box retailers. I will change their actual name in this column so as to protect their identity. 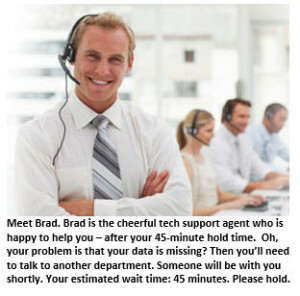 I walked into WORST BUY, and the salesperson Brad was quite helpful. He directed me to a perfectly adequate laptop. It had keys with letters and numbers in exactly the right locations. He told me that it had a 1.33 gigahertz dual processor with 2 GB of memory, 32 GB of storage, and a Windows 8.1 64-bit something or other. I had no idea what he was talking about, but it came in blue. I like blue. So I bought it. Then I asked Brad if they could transfer all my data from my old computer to the new one – you know, email contacts, calendar appointments, embarrassing photos of my girls naked in the bathtub when they were two years old, saved so I could show them at their future weddings – you know, important files. For the very reasonable fee of $150, they could transfer it all. So I said “sure.” Brad then passed me over to their tech team, the name of which, again, out of respect for their privacy, I will disguise. After only a 20-minute wait, I was greeted cheerfully by a member of their Greek Squad team named Nick, who was extremely helpful and said the job would be done overnight. So when they finished the overnight job four days later, I returned to WORST BUY to pick up my new computer. When I got home, I discovered just how helpful they had actually been, and by “helpful” I mean they had somehow managed to lose ALL OF MY DATA. But this was entirely my fault. You see, when they told me they could transfer all my data for a fee of $150, I neglected to mention the desired destination of that transfer: my NEW computer. God only knows where they actually sent my precious data. My BEST guess? The new laptop of some other customer – who is now wondering what deviant dude saves photos of naked toddlers bathing. So I called their toll-free tech support hot-line: 1-800-YOU-R-FUKD. After 45 minutes of listening to Muzak, I reached a presumably live agent: Boisterous Becky, who told me it would be only another brief 45 minutes before “the next available tech support agent” could assist me. To my relief, she assured me that my satisfaction was their #1 priority – or maybe #2, right after putting all the phones on hold so they could watch Game of Thrones, season three, episode 7 – a real nail biter. As I was on hold waiting for Game of Thrones to end, I was greeted every 30 seconds by a series of cheerful suggestions for how I could solve the problem (which they had created) by visiting their website and checking out their FAQ section. There were also invitations to chat online with a live agent – which I’m now convinced was a trained monkey who has been taught how to copy and paste the following message: “I will be assisting you momentarily.” Apparently “momentarily” has a very different meaning in the world of tech support call centers from its meaning where I was raised. Or maybe time just moves more slowly in India. So Casey/Tony finally solved the problem and restored all my contacts and all my calendar items. Looked like clear sailing ahead. And it absolutely was clear sailing – for about five minutes after I hung up from Casey/Tony. All was fine, so long as I had no need for any of my 3,000 saved emails or any of the 250 blog posts I had written over the past six years – or as my wife would call it, “no great loss.” Somehow this Greek genius had deleted them all. The next thing I knew, I was I was on the phone again, waiting for the next episode of Game of Thrones to end. But in less time than it takes to bake an apple pie from scratch, an agent came on the line to cheerfully tell me that wait times for tech support were now averaging over 60 minutes. The subsequent two-hour wait gave me just enough time to vacuum the house, defrost the freezer, mow my lawn and still have time to do the Sunday New York Times crossword puzzle. When I finally reached a tech support agent named Luke, he politely informed me that 1) my satisfaction was his #1 priority and 2) as best as he could tell, Casey/Tony had really fouled things up. It took him over two hours – with me sitting on the phone – before he could finally restore all my missing data and get my computer working properly. I estimate I wasted at least four hours on the phone with WORST BUY’s tech support plus another three hours sitting on hold. But it appears that FINALLY, my computer is working properly. Luke assured me that all my files should be saved and I should have no more problems whatsoever. Um, I gotta go. Looks like I need to call WORST BUY again. I bought my nice all-in-one computer online, directly from Dell, using a lovely employee discount benefit from the place where I earn my daily bread. It came already loaded with Windows 8 and I had saved all my important stuff either on flash drives, Google Drive or a removable hard drive. You save a lot of problems that way! I hope you got your $150 returned. And then I hope you used that windfall to find an actor from Game of Thrones who is dead (apparently that happens every episode) and hire him to go to WORST BUY every day and threaten them with mayhem. Actors are always looking for gigs and $150 should go pretty far! Just who the hell is the “system administrator” anyway?